ED Jones/AFP/Getty ImagesDonald Trump (L) is pictured with his sister Maryanne Trump Barry. The New York Times’ bombshell investigation into President Donald Trump’s wealth came about in large part from one document filed years ago by his sister. Maryanne Trump Barry, now a federal judge, submitted a filing during her Senate confirmation that revealed the existence of a company called All County Building Supply & Maintenance. The Times said the document was “central” to its investigation. The New York Times’ bombshell investigation into President Donald Trump’s wealth came to fruition after a Times reporter discovered a critical piece of information on a filing that Trump’s sister Maryanne Trump Barry submitted to the Senate as part of her confirmation to the federal judiciary. The Times said on Tuesday that this document led to the uncovering of “a central finding of the story”: the existence of a company called All County Building Supply & Maintenance. The Times said the document was discovered when the reporter, Susanne Craig, searched on Google for “Trump” and “mortgage receivable,” a term the Trump family used to describe mortgages from the children to their father, Fred Trump. What Craig found was an unredacted disclosure form from Maryanne Trump Barry, now a judge on the 3rd US Circuit Court of Appeals, that was filed during her confirmation process. On it, Craig spotted a $US1 million contribution from All County Building Supply & Maintenance. That company, which The Times called “the most overt fraud” the Trumps set up, was the focus of much of its investigation. Craig and her Times colleagues conducted interviews and reviewed more records about the company, which they were told served as a middleman to move cash from Fred Trump’s companies to Donald Trump and his siblings. Formed in 1992, the company was to be a purchasing agent for Fred Trump’s buildings, but it instead was used to siphon millions from the elder Trump’s empire by marking up purchases that were already made, The Times reported. According to The Times, the company’s address was listed as the home of Fred Trump’s nephew John Walter in Manhasset, New York. Walter, who died in January, managed much of Fred Trump’s records, and his basement was filled with boxes of those documents, The Times reported. “Each year Fred Trump spent millions of dollars maintaining and improving his properties. Some of the vendors who supplied his building superintendents and maintenance crews had been cashing Fred Trump’s checks for decades. Starting in August 1992, though, a different name began to appear on their checks – All County Building Supply & Maintenance. “Mr. Walter’s computer systems, meanwhile, churned out All County invoices that billed Fred Trump’s empire for those same services and supplies, with one difference: All County’s invoices were padded, marked up by 20 per cent, or 50 per cent, or even more, records show. 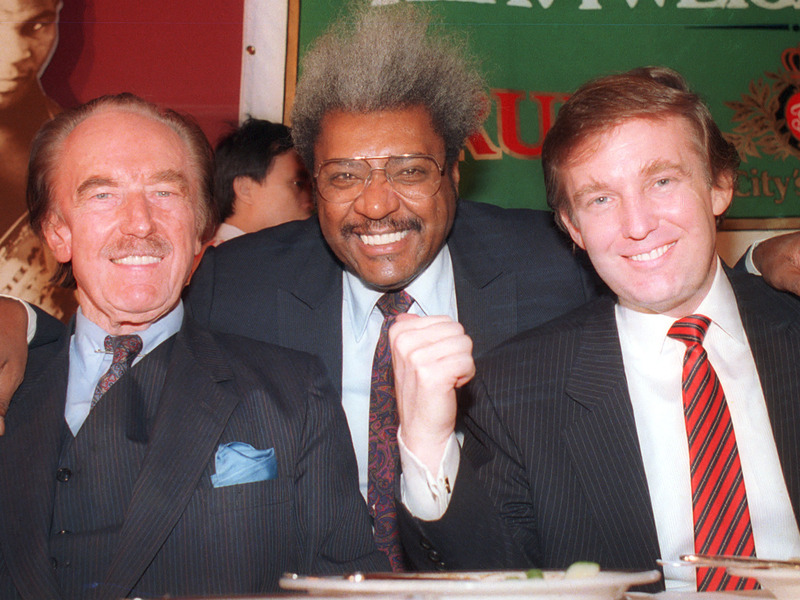 (AP PhotoFred Trump, Don King, and Donald Trump. The White House press secretary, Sarah Huckabee Sanders, said during Wednesday’s press briefing that the story got only one thing correct: that Trump’s father “had a lot of confidence” in his son.